The American Evaluation Association national conference in Washington D.C. was a great time to catch up with other evaluators, find out what is going on in our and related fields, and reflect on my research and evaluation work. Don’t worry, I wasn’t involved in any incidents requiring an emergency response. However, I did present a poster on our collaboration with a law enforcement agency regarding their 911 communications centers in South Florida. I am co-PI on the project through our university. 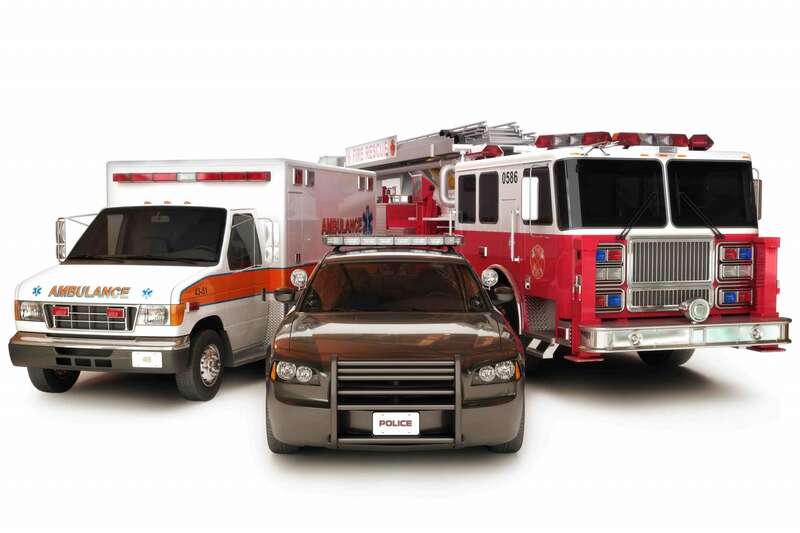 We are assisting with evaluating the hiring and retention systems the agency uses for their communications operators. These are the people who fill the critical role of answering 911 emergency calls from the public and dispatching first responders to incidents. Thanks for the ideas and feedback for those of you who stopped by during the session. Also, the conference got me thinking more about my use of logic models. I find that the process of developing them with stakeholders is often just as helpful as the end result. Encouraging a team to clearly identify what a project is and what it is not, this process helps groups to decide about priorities regarding a particular effort and come to a consensus about how to get to the desired results. Ciara Paige from Claremont Graduate University presented on her group’s findings related to the incorporation of data visualization principles and other elements into logic models. They had some interesting preliminary findings showing possible benefits for individuals attempting to read and understand a logic model that was presented to them. 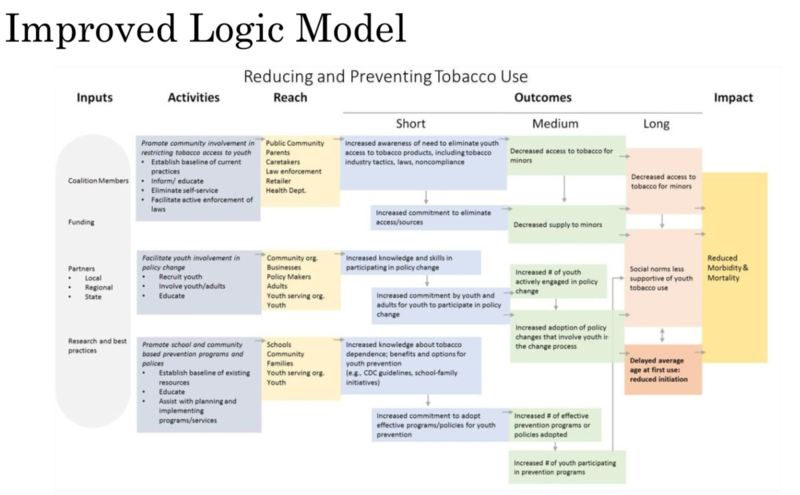 As part of the study her team took a logic model that was previously developed for a youth tobacco use program and made several design changes to it. Below is the color version of the improved logic model they used. It makes sense that style and format would have an impact on usability. * Used with the permission of Natalie Jones, Tarek Azzam, Darrel Skousen, Ciara Paige, Dana Wanzer and Nina Sabarre. So I am part of a team that is developing a logic model for a grant proposal we are writing to fund a project that addresses the needs of college students who are veterans of the U.S. armed forces. Working on the logic model has focused our group to clearly identify the needs of the target population, programmatic outcomes that would be beneficial to the veterans and the university community in general, and activities and strategies to achieve the outcomes. I am using Lucidchart.com, a web-based app, to share the logic model with our team so the process can be more collaborative. You can click on the image below to access a template I developed to share through this post. I incorporated some of the design elements from Ciara’s study into the template. 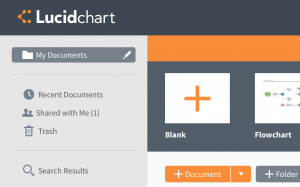 The link will direct you to the Lucidchart website where you have to set up an account (they have a free account option) to access the template. After you set up your account you will see “Shared with me” to the left. Select that and you can use the template I developed. 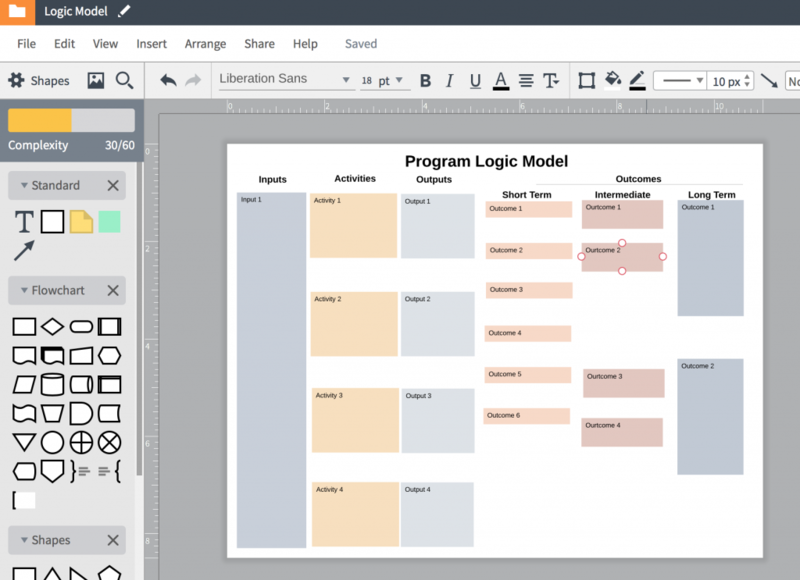 The application is pretty easy to use and is helpful for concept mapping, flow charts, and other visuals. You can add arrows, change the number and size of the boxes, etc. Let me know what you think and if you use other software to work on logic models with teams.